First off, we had to get an outfit. 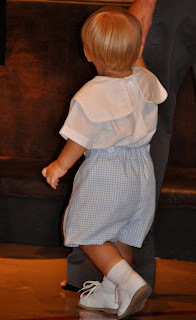 I knew I didn’t want him to look like a mini penguin in a tuxedo, so I opted for a little boy’s sailor suit. The best part of that decision was that I had found a really cute sailor suit at a consignment sale a few weeks earlier. 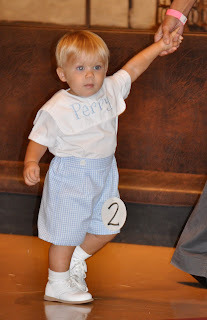 Wanting to dress it up just a bit, I decided to personalize it by monogramming Perry’s name on the collar in baby blue. Then next came the… wait. Wow!! Little boy pageants are a breeze to pull together! 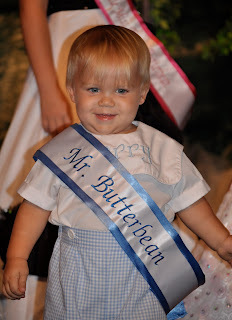 So, on Saturday morning it was off to the famous Butterbean Pageant. In typical Perry fashion, he loved seeing all the other little babies that were there, and was not shy at all when doing his practice run. 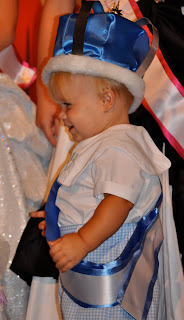 Although he was a little more timid during the actual pageant, he still managed to show off a bit, clapping for himself when the audience would and waving bye-bye to everyone as he exited the stage. Whenever it came time to announce the winners, Perry received the title of best smile (which was no surprise to me since his smile always makes my heart grin) and best dressed (which I was very excitedly surprised about!) But then came time for crowning and when they called out the prince award, it did not go to Perry. I’m not going to lie, I was a little bummed. But then, they kept calling out more princes. Then, they called out the alternates, and I realized quickly that every other boy’s name had already been called. Then I heard, “And your new Mr. Baby Butterbean goes to…. Perry Murphree! !” Seriously!! I would never have thought I would be so proud to be little Mr. Baby Butterbean’s Mommy! It was so funny to me to be so excited about Mr. Perry’s accomplishment, even knowing he didn’t have a clue in the world what was going on. 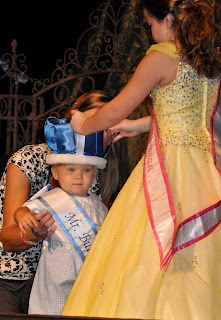 For his winnings, Perry received a darling little crown and a monogrammed sash, a photoshoot with Cameo Modeling, and the opportunity to ride in the Christmas parade as Mr. Baby Butterbean. It is just so much fun to be a Mommy to such an amazing little bitty!! I had no idea you were into pageants! That is awesome that Perry won! But it doesn't surprise me since Perry is so adorable! 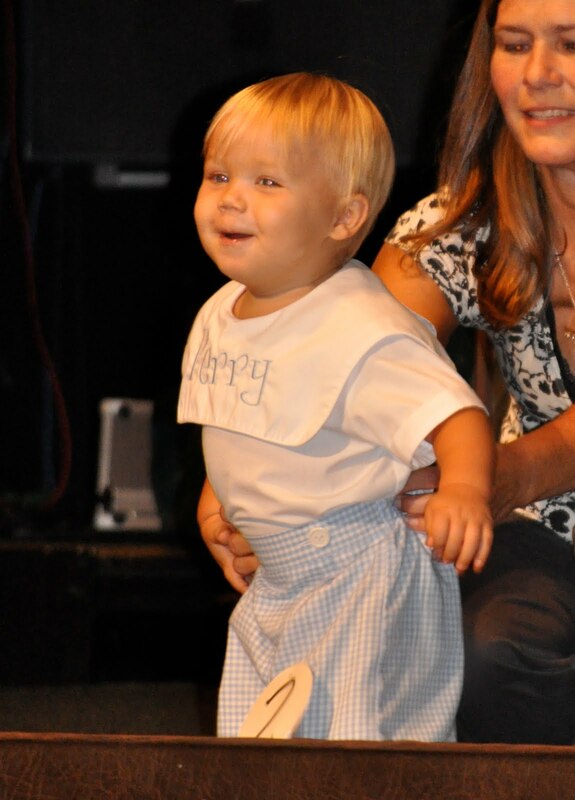 And I love his outfit!